Communications agency Purplefish has created a dedicated events planning team with two new appointments. The Bristol-based consultancy which specialises in brand campaigns for clients in the tech, property, business and hospitality sectors has welcomed Julia Bassett as the new office manager with responsibility for the planning and execution of client events as well as overseeing the smooth operation of the business. She will work with Gillian Mckenzie, who has joined the team to provide event and project support. Julia joined Purplefish after moving to Bristol from London where she worked as events manager for a major US law firm, running their programme of events from conception to completion, including conferences, workshops, dinners, receptions and retreats. Gillian has 18 years’ experience working in hospitality and has worked on a wide variety of events from weddings and in-house promotions to major public events such as Wimbledon and Glastonbury Festival. The pair will now work together to enhance the communications consultancy’s events offering in response to a growing demand for more events and experiential based PR and marketing campaigns. Julia said: “I’m so pleased to have joined such a dynamic agency with a team that is always working to improve its services for clients. “With Gillian and I, Purplefish has really boosted its events planning capacity and can offer a greatly enhanced service to clients. Gillian said: “I’m really looking forward to working with Julia and the wider team to ensure the success of all Purplefish’s client events. Purplefish moved to a new office at the Paintworks at the end of 2018 having outgrown its previous home on an old Dutch barge in Bristol Harbour. The new base will support the company’s future growth. 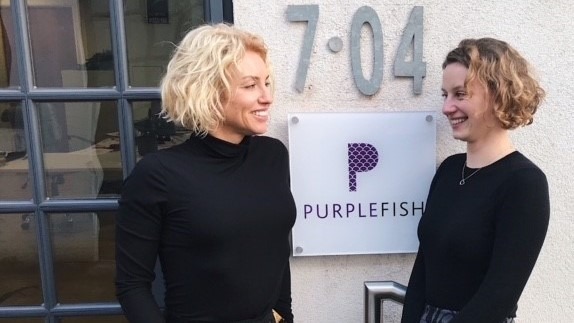 Joanna Randall, founder and managing director of Purplefish, said: “We’re thrilled to welcome Julia and Gillian to the team. “We experienced a growing demand from clients for support on events of all scales and styles, particularly in the last 12 months, so we decided to bolster our expertise in this area with two highly experienced events professionals. “Even though we are now in a digital first world when it comes to communications campaigns brands and businesses often need a physical way to bring their products and services to life. We have organised experiential activities for app launches, bar and restaurant venues and property brands and we’re seeing a growth in this activity. Purplefish works with creative and tech-focused businesses that want to achieve fast growth using bespoke, insight-led communications.